It’s mid-January, so the NEBRA staff has been taking advantage of being too soft to ride outside in this weather to prep for the 2019 season. 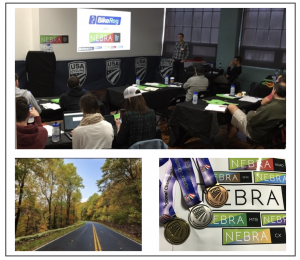 We’ve got a bunch of ‘exciting’ information for you, New England bike racers, and a bunch of it is somewhat time sensitive because the new President of NEBRA is most effective when deadlines are looming (aka “now”). We had been doing the Annual Meeting for the corporation of NEBRA by conference call on the Monday night after the promoter summit. Attendance at this meeting was historically low, as was engagement, because No One Likes Conference Calls (™). This was especially ironic because attendance at the Promoter Summit the day before is good and engagement is high. So we are doing an actual in-person Annual Meeting at the summit this year — JD’s “State of the Nation” address will double as the Annual Meeting, where we’ll also go over two items that are up to the membership for a vote, and do the traditional “airing of grievances” where the membership gives the board “feedback” on what they feel went poorly/swimmingly in 2018 and what they’d like to see in 2019. *If you can’t make the Annual Meeting, we will be live streaming it*. The retirement of some longtime board members means that only one incumbent (Joe Rodrigues) is running for the FOUR board seats we’re electing. There’s going to be some big changes in the board’s makeup, and we are thrilled to have a group of qualified candidates running for those seats. Members will receive voting instructions on 1/23, and the results will be announced on 1/30. Remember that each NEBRA club gets one vote. Turns out our original Articles of Incorporation specify that New York-based clubs and Race Directors can be members, and you can only change the Articles of Incorporation by a vote of the membership. While this may have made sense in 2002, it probably doesn’t any more, so we’d like to remove it. So y’all have to vote on it. We also have some major bylaw changes (teased here, final version coming soon:http://nebra.us/wp-content/uploads/2018/12/Bylaws-of-the-New-England-Bicycle-Racing-Association-NEBRA.pdf) that we’ll be doing a non-binding vote on**. *You know how livestreams can be. I promise we will do our best! **It’s non-binding because the bylaws are technically changed by a vote of the board, but if the membership voted against the new bylaws, the board would pump the brakes on this initiative and gather additional feedback rather than making an unpopular change.